Closely following the passage of the E-government Act of 2002, the United States government has opened an Internet portal (www.regulations.gov) to facilitate public participation in federal rulemakings. This is an initial step toward creating an online environment in which public participation in federal rulemaking may be greatly enhanced, in terms of both the breadth and depth of the involvement. The successful realization of this democratic ideal will depend on many details of the implementation process for online rulemaking. This paper suggests a framework for viewing this process and offers suggestions for the next steps in constructing a viable system. Online rulemaking will be a challenging initiative for federal agencies to implement. The challenges arise not from any particular technical complexity, but from the environment in which this initiative will be implemented. There are three major elements to consider – the agencies, the public and the technology – as illustrated in the diagram below. First there are agencies, many of which have rulemaking as an essential part of their core agenda. Second, rulemaking involves public participation, and online rulemaking will likely increase the number of attentive public stakeholders. And third, online rulemaking requires the smooth integration of new technologies into the practice of both agencies and stakeholder groups. These three factors intersect in various ways, as the diagram makes clear. 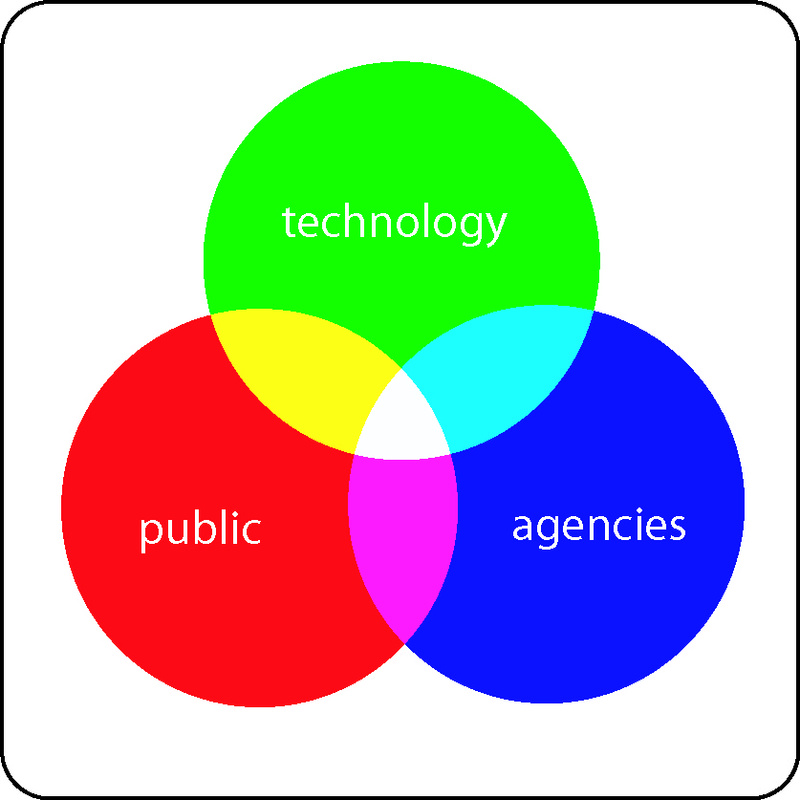 The intersections reflect agency use of technology (the cyan part of the diagram), public use of technology (yellow), public interactions with agencies (magenta), or the manner in which technology connects the agency to public stakeholders (the white central part of the diagram). We will discuss in turn each of the three major factors that impact on electronic rulemaking and the many challenges inherent in their intersections. First we consider the three individual factors. rules will impact many federal players. Within the federal community, there are agencies with very different missions, histories and cultures. Each agency has its own set of traditional stakeholders, with whom a symbiotic relationship has typically developed over decades of interaction. In addition, each agency has a group of internal participants in rulemaking, including program and legal staff, public relations personnel, regulation writers, and – for online rulemaking – IT personnel. New structures for rulemaking should not build in processes that simply reflect “the way we’ve always done it” but should maintain practices and information linkages that have proven to be functional and successful. Further, if a new system is to be an asset to both agency users and stakeholders – rather than something they must work around – it should be designed with their participation in the process. The challenge of adapting a new system to agency practice may be as great within some agencies as across different agencies. At the same time it is clear that rethinking internal procedures can present opportunities for reform. One example is the potential to decrease excessive compartmentalization within agencies and the resultant barriers to information sharing. Electronic rulemaking, by its nature, minimizes bureaucratic compartmentalization, and the processes by which electronic rulemaking is developed should be such as to encourage the removal of purely bureaucratic barriers to information access. The Public. There are currently two primary categories of participants in rulemaking. First there are the traditional stakeholder groups – regulated industries and their trade associations, and public interest groups organized around issues related to agency concerns. These organizations are typically conversant with the rulemaking process and the technical issues that underlie a given rule. Where they are unfamiliar with procedural or technical issues, regulated industries will usually possess the resources needed to acquire this expertise, and public interest groups will also often be able to do so. At least for groups that can afford a Washington presence and their own legal and technical staff, there may be a semblance of a level playing field. Individual contributors who are relatively new to the rulemaking process make up the second group of participants who have been active in some rulemakings. They can be expected to increase as the process goes online. These individuals will often have had many years of direct experience in the fields of endeavor affected by the proposed rule; others may have experienced some personal impact. These individuals can bring powerful anecdotal testimony to bear on the proposed rule. We expect the interactive mechanisms of online rulemaking to help produce ad hoc coalitions of stakeholders – or communities of interest – as online participants become aware of one another in their responses to a particular Notice of Proposed Rulemaking (“NPRM”), or in discussions of a set of related issues over time. Such coalitions might involve combinations of individual contributors and existing public interest groups, or they may arise spontaneously as individual contributors pool their experience and knowledge and synthesize new positions. We regard this dynamic as one of the most exciting possible consequences of this new approach to rulemaking. New participants, whether individuals or coalitions, may lack a detailed understanding of the process itself or technical knowledge of the issues under discussion. To work productively within the rulemaking framework, they will need more preparatory information than the traditional stakeholders. This will increase the value of public testimony by increasing its relevance to the rule under discussion, as well as the accuracy of the generalizations that individuals draw from their personal experience. The Technology. Several levels of technology will be deployed as part of electronic rulemaking systems. Most obviously, there is the Internet itself, which is simultaneously the vehicle for agencies to disseminate their NPRMs and supporting background and analytic material, and the delivery mechanism for stakeholder responses. Beyond access, which will be discussed below under “Public Use of Technology,” the technology issues are twofold: storage of the information necessary to an electronic docket, and the collection and extraction of that information. There are multiple audiences for these processes, including agency personnel, traditional stakeholders and new contributors, both individuals and ad hoc coalitions. We will address the needs of these different groups in later sections, in terms of the intersection of technology with the agencies and the public. Data storage. Data storage will involve some type of database. Traditionally relational databases have been used, and these may continue to be the repository of choice. However, cost, speed and scalability should be considered in selecting technologies for this purpose. With the development of low-cost, high-speed server platforms and the existence of high-performance open-source software for these platforms, there exists a truly wild range of prices for products of this sort. Data collection and extraction. Data collection will likely be done through Web forms. Where forms are too restrictive agencies are apt to invite the submission of attached electronic files. Two caveats are appropriate here. (1) Forms have the nice feature of inviting the inclusion of a number of indexing fields likely to be useful in organizing and analyzing the information received. It is easy to envision the translation of these fields into, for example, XML tags that can be manipulated by commonly available software. If the same information is collected through attached files or e-mail, there is a danger that useful indexing information may not be included or, if it is included, that it may be hard to extract from the document. Automated processes can attempt to find this information, but it will be easier if it is collected up-front and with the concurrence of the submitter. (2) Unless agencies specify standard file formats for their submissions, preferably in terms of published public protocols, they will inevitably receive materials that they can’t read. With electronic submissions, it’s entirely possible that the agencies would not even be able to read the return address, in which case they would have no way of notifying the submitter that clarification is necessary. This level of uncertainty would be unacceptable in any legal proceeding, to say nothing of the frustration it would cause for many public users of the system. Data extraction will involve queries of two types. One type of query involves a simple search – for example, to find individual records, such as the comment on a particular rule by a particular stakeholder. Such queries can be easily handled through online Web forms. The other type involves an analysis covering an entire docket or a set of dockets, for example, a request to find the locations of all facilities mentioned that use a particular environmental contaminant in their industrial processes. In some cases the necessary analysis tools can be built into the electronic docketing system. More typically, an individual or organization interested in a complex query of this sort will need to extract all of the records from a particular docket or set of dockets and perform the analysis on their own system. For this second type of query it would be extremely awkward to use an online Web form. Consider, for example, a docket with 10,000 public comments. If agencies follow the design principle of “3 clicks and you’re out,” it will take 3 mouse clicks to conduct the simple query described above; but to extract information from the entire docket would require 30,000 mouse clicks! And if the agency did not supply a complete index of the docket, it might be impossible to obtain. The solution to this problem is to provide software access to agency databases. One available technology is “Web services,” which allow software on one machine to make a “remote procedure call” (“RPC”) to software running on another machine. Through an RPC, a program on one computer can invoke the functionality of another computer. In the present example analysis software on a stakeholder’s computer could use an RPC to extract all comments pertaining to a particular docket and transfer them to the stakeholder’s machine. Modular design. At first glance it might seem cumbersome to build mechanisms like this into the electronic docketing system. But the same type of technology – and the same type of data architecture – may also be very valuable at an earlier stage of the design process. The relevant design principle is modularity, and the need for a modular architecture relates to the great diversity of databases employed by federal agencies at present. In a modular design different software components communicate through standard protocols, and components from different vendors become interoperable. The components can then be arranged in different ways for different purposes. A Web portal module can be constructed to communicate with database modules running at various agencies. In this manner the government can achieve its goal of providing a single point of access for all federal rulemakings. But the same database modules can also communicate with remote software through specified Remote Procedure Calls, and this meets the secondary goal of access to agency databases for the purpose of complex, remotely performed analyses. The modular design provides a solution of problems simultaneously, since the Web portal can use the same RPCs to communicate with agency databases as the analysis software on stakeholders’ computers. An alternative approach to system design is superficially equivalent to our proposal for a modular data architecture. This is simply to select one product that includes both a Web front end for input and data extraction and a database to house this data. The government might mandate that all agencies adopt this product for their rulemaking records. There are several objections: (1) It is likely to be more expensive than a modular approach. (2) Implementation of a single system is likely to be more disruptive than implementation of a modular design. (3) The modular approach respects the “write once; use many times” philosophy that underlies much of today’s successful software development. The single vendor approach is, by contrast, a philosophy of “buy once; make everyone use it,” which is a difficult program to enforce, except in the most rigid and hierarchical organizations. The diagram in Section I illustrates the major elements in online rulemaking – federal agencies, public stakeholders and available technologies. As the diagram implies, there are a number of important overlaps or interactions between these factors. We will discuss the issues that arise from each of these interactions. Agencies and the Public. A major consideration for interactions between agencies and the public is in the area of participation. As noted previously, the more traditional participants in rulemaking tend to have been organized long before the NPRM is issued, and typically possess resources that have permitted them to take part effectively in rulemakings under the old paper-based system. These groups will likely adapt to whatever agency structures are set up for rulemaking. They often have in-house technical expertise and are conversant with the legal boundaries of a typical rulemaking. Individual participants or members of ad hoc coalitions are apt to appear before the agency with far less preparation and with expectations shaped by commercial Web sites. They will reasonably expect agency sites to be available 24 hours a day and 7 days a week, to be easy to navigate and to comply with applicable guidelines for disability access. They may not fully understand the structure of a rulemaking process, and they cannot be expected to know the ins and outs of the technical issues that underlie the proposed rule. Hence it is necessary for agencies to provide materials – preferably online – that explicate rulemaking in general and the current rule in particular. These materials must be more detailed and must start at a less sophisticated level than the background materials in a traditional docket, and they should cover the ground thoroughly enough that less experienced players can come up to speed as full participants in the rulemaking process. They should also spell out the ground rules for participation, lest expectations exceed what is possible within the rulemaking process. People may not understand that public comments are not a vote, for example. Another common misperception is that an agency could take steps that are not possible under the law that lead to the rulemaking. Public comment on the law might be appropriate, but it should be directed to Congress, not the agency working to implement the law. Participation is always a two-edged sword for agencies. Done well, it can increase citizen satisfaction, knowledge and sense of ownership. It can also help broaden the knowledge of agencies and increase understanding of stakeholder needs, and it can help the public appreciate why and how certain agency decisions are made. Significantly for both the agency and the public, an open process can let everyone understand that many individuals are involved in the process – as opposed to “faceless bureaucrats” or strident interest groups. Done inadequately, however, participation can increase public frustration and hostility towards agency decisions and decrease public trust in government. This means agencies will need to plan how they will receive, review and respond to public input; to train staff for greater interaction with the public; and – as outlined earlier – to develop rule-related background materials for agency Web sites. Over a longer term rulemaking should come out of the shadows and take its deserved place in civics curricula. After all, the majority of laws passed by Congress lead to rulemakings, and it is nearly impossible to read the front pages of a major newspaper without encountering the phrase. But this is not a topic taught in high schools. Nor is it prominent in business curricula or even law curricula. This should change as public participation in rulemakings becomes a more common event. Agency Use of Technology. Online rulemaking is not very different from other technology initiatives in terms of how agencies can interact with contractors to achieve their objectives. That said, it is worthwhile reiterating a few general principles. First, system architecture should be approached from a modular viewpoint. Modules can be defined as separate components insofar as they accomplish specific, limited tasks and have clear mechanisms for accepting input and producing output. Second, managers should take a high-level view of system components so as to recognize where modules may be reused in different projects. Third, the components must communicate by means of published protocols that meet established public standards. Only in this manner is it possible for systems to be interoperable among different vendors, to easily scale for high traffic volume and to remain viable over several cycles of future product development. Specific components for online rulemaking systems will include databases for document storage and front ends for gathering information or extracting results. Some sort of “middleware” will glue these pieces together, preferably in such a way as to allow various levels of access and for a variety of databases and front ends. The system should incorporate a security model to meet the needs of both agency personnel and members of the public. As currently envisioned by the Office of Management and Budget, the Environmental Protection Agency and the partner agencies that have developed regulations.gov, the online rulemaking system will also include analysis tools that facilitate regulation writers’ tasks. Such tools can help analyze public comment and provide a joint authoring environment for agency staff to collaborate on the final text of a rule. Ideally the analysis tools should be coupled to structured input forms used for the initial submission of comment. Through such forms commenters could indicate the precise sections on which they wished to comment and could answer specific questions that the agency might have posed in drafting the NPRM. A final issue in selection of technology for agencies relates to cost. Since online rulemaking will eventually encompass dozens of federal agencies, the incremental cost for additional users becomes a significant issue. As more and more agencies join the activity, seeming economies in the establishment of pilot systems may appear irrelevant. This is a place where the higher development costs of Open Source systems may be more than offset by the ability of such systems to grow with no additional costs. Open Source systems also fit nicely into the paradigm of open standards and protocols, which are essential for an activity of this sort. Public Use of Technology. As the Internet becomes the principal route for public entry into rulemaking, along with other government information and services, it is essential that Internet access be open to all, with public sites where any member of the public can participate fully. Fortunately, with Internet access now commonplace at schools and libraries and with home connectivity becoming increasingly the norm, the digital divide concerns of a few years ago are becoming less threatening to the concept of an electronic democracy. Nonetheless the issue has not gone away. It may be necessary, for example, to deploy Internet kiosks in Post Offices and other government buildings, or to provide Internet access through voicemail systems or TV set-top boxes. Beyond simple access, there are two modes of usage that will involve new technologies. The first new mode of usage is relevant to organized stakeholders. As we have argued previously, this group is likely to look for capture tools that allow them to copy an entire docket to their own computer where they will use analysis tools to help them process the information in the docket. This group of stakeholders will also be interested in details of the technical models some commenters use to undergird their testimony. The Internet makes it possible for agencies to invite these commenters to make their models available online so that other commenters can explore their behavior under initial conditions and input data that may differ from that of their originators. This sort of “open modeling” can help clarify complex testimony and work around some of the mystery created by the proprietary code that may underlie the technical models. The second class of participants consists of individuals and members of ad hoc coalitions. For such participants a key feature of online rulemaking will be the way in which communications technologies help form and bind communities of interest. Ad hoc coalitions can become just such a community, with the technology facilitating linkages between individuals with anecdotal information relevant to a rulemaking and those who have the technical expertise to generalize from these anecdotes and help the agencies develop policies that can address the problems that underlie these stories. Bringing it all Together. The intersection of the interests of the agencies and the public with the potential of the technology, as represented by the central portion of the diagram in Section I, is where many of the ideas in this paper come together and where some of the most innovative possibilities for online rulemaking exist. These innovations can start with very simple steps, such as the active notification of interested parties on rules in a given area. An expansion of the concept of active notification could allow public involvement at earlier stages of the rulemaking process, giving stakeholders a voice at the issue-scoping stage and documenting the extent of participation by different sectors of the stakeholder community. Where issues have not been too politicized, a broadened group of stakeholders who interact with the agency on a given topic over time could, with the help of technology, form a virtual community made up of the agency and the public, which shares information and works collaboratively. The social dynamics of such a community could facilitate negotiations, both by taking a greater range of stakeholders values and needs into account early on and by increasing understanding of the information the agency is working with. It could also help smooth the path for the construction of future rules. Of course an adversarial element will remain, and may become sharper in the areas of enforcement and monitoring, where access to an online record could facilitate the actions of groups who may alert the agencies to possible violations of a given rule. We expect some of the stakeholder community to develop their own tools for analysis of the electronic record that will ultimately follow a rule from its initial scoping through adoption, monitoring and enforcement. These tools will likely operate in the context of private sites that mirror agency databases, perhaps supplemented with other externally-generated resources. The public launch of the regulations.gov Web site (January 23, 2003) is being followed by intensive activity on the part of the Office of Management and Budget, the Environmental Protection Agency and the partner agencies that are working to develop a common approach to online rulemaking. Over time these agencies will encounter major challenges, particularly in terms of scaling to rulemakings with large numbers of participants and paradigms for large-scale public involvement. In this paper we have tried to highlight a number of issues that can be dealt with on a shorter time scale and whose resolution should help facilitate the current development process. In this section we summarize our recommendations for features that we believe to be useful for the systems currently in the stages of design and implementation. Active notification. Stakeholders should be able to sign up for information on rules that affect a particular community of users, independent of the agency that is working on these rules. The Department of Transportation (DOT) is already doing this, using a simple listserv mechanism. Tracking systems. Such systems could replicate the very popular service of many shipping companies, which let customers see when they may expect the delivery of a particular product and where that product currently is in the shipping cycle. In the context of rulemaking, stakeholders – and agency personnel, for that matter – could track the progress of a given rule. This functionality is also available in the DOT system. Indices. While search engines are an essential component of online records systems, they are not a replacement for reliable indices. Indices with hyperlinks to all archived elements are essential for systems where the records are stored in a database, since otherwise there may be no means of retrieving all of the available records. Also, indices are usually much easier to browse than the results of a search – unless the search has used tagged fields to generate what is in essence another index. Modular design and standard communication protocols. To facilitate interoperability among the many agency databases and to permit expansion from a simple electronic rulemaking system to a digital library for all government records, it is essential to develop a modular system, with standards for communication between modules and adherence to published public protocols. The development of systems with reusable modules also makes it possible to address difficult issues such as preservation and security on a government-wide basis. Web services for database access. This type of access will be important for larger stakeholder groups. It permits an organization to copy, for example, all the materials for a given rule into a local database for further analysis. If the systems for online rulemaking do not include this capability explicitly, then users are apt to cobble together access mechanisms that provide them with the same functionality – but at significant cost in terms of efficiency to themselves and to the government’s online system. Possibilities for custom front ends. The provision of Web services that provide access to agency databases will open the door for commercially-developed front ends that take information from these databases and add value through analysis or supplemental data. Such custom front ends will provide new commercial opportunities while giving the public a broader understanding of docket materials. Reply comment periods. This innovation is part of the rulemaking process followed by the Federal Communications Commission. The idea is to split the comment period into two sections. The first section lets stakeholders lay out their positions; the second invites comment from other stakeholders on those positions. This structure simplifies the agency’s chore in responding to stakeholder suggestions and can lead to discussions among stakeholders, which have the potential to clarify viewpoints. Background materials. As the Internet enlarges the audiences for rulemaking agencies will need to expand the background materials that they provide to permit someone previously unfamiliar with the subject to learn enough for them to take part as an intelligent and constructive commenter. Open modeling. Beyond text and tables, dockets often include the results of mathematical simulations – of economic models, pollution transport, etc. Through the Internet, submitters can post their models as interactive online elements. Even if the model is proprietary, this can provide an opportunity for other commenters to experiment with it. It can also allow more intelligent use of models in the drafting of a rule, since it will now be possible to vary the inputs to such models and see how frangible their output might be. Online dialogues. For rules that attract broad public interest a more organized dialogue may be desirable. The Internet can be used to conduct a moderated asynchronous discussion, using background materials provided by the agency to lay the groundwork. Communities of interest. The group of people who interact with a particular agency on a particular set of issues tends to involve the same set of players over time. Through the dialogue that will occur in an online docket – whether or not the agency chooses to facilitate that dialogue through explicit mechanisms as suggested above – this group of people may develop a degree of community. We believe this can deepen the discussion of issues among its members and thus help the agency develop reasonable and enforceable rules. Public input early in the process. There is sometimes a perception that decisions have already been made by the time a NPRM is published. If stakeholders can be involved at earlier stages of the process, it may be possible to reduce acrimony and produce rules that embody more of the sense of the broad stakeholder community. One example might be to invite broader public input to FACA proceedings and to conduct some of these proceedings online. Model participatory behavior in the development process. One of the strongest messages that an organization sends out to its stakeholder groups is given by the manner in which the organization develops new initiatives. If a participatory model is adopted for the development process, then there is some assurance that the organization is truly dedicated to significant participation in its ongoing activities. This may be a challenge for organizations facing tight project deadlines, but it could go a long way toward assuring that the new systems will be truly participatory in nature. Continuous electronic record. While regulations.gov focuses on that stage of rulemaking that begins with the NPRM and ends with the published rule, that process cannot be considered in isolation. The NPRM does not come out of nowhere, and a published rule is meant to be enforced. Hence it makes sense to design the electronic records systems for online rulemaking with an eye toward extensibility and to take care to integrate these systems with agency processes that precede the NPRM or follow publication of the final rule. Public role in enforcement and monitoring. With the existence of a continuous electronic record it becomes easier for industry and public interest groups to monitor the enforcement of a given rule. This fits in with other objectives of electronic government – to facilitate the work that a business must put into compliance with federal regulations and to help citizens understand the tools that are available to help them deal with local issues such as transportation needs, healthcare concerns or environment degradation. Open source implementations for stakeholder groups. We believe that governmental records systems should be made for mirroring, in the sense that they must be open for access by any interested parties and that this access should not be prejudiced in terms of certain classes of users (such as those interested in only a handful of specific records). Thus it is worthwhile to consider the likely architecture of systems used by stakeholder organizations and how best these systems might connect with governmental systems. For many non-profit organizations there is a clear trajectory toward open-source, open-standards solutions. While this alone might not dictate that the government adopt solutions of this sort, the systems selected by the government should not interfere with the use of open-source, open-standards systems by outside stakeholders. Structured input forms and analysis tools for regulation writers. Structured comment forms will help commenters to be more precise in their submissions and to answer questions that the agency may have posed in its NPRM. These forms can be used to route materials to the agency staff who are addressing particular issues within the rulemaking. More generally, agency staff will need analysis tools to help them process material received from the public. These tools will speed up the process of rule development, increase the accuracy of agency staff work and lowering agency costs. Standards for state and local governments and for international issues. We have emphasized the need for standards for the components of federal rulemaking systems in order for the systems of different agencies to be interoperable with each other and with those of various stakeholder groups. A larger interoperability problem arises with state and local governments, but the adoption and publication of standards for federal agencies may clear the way for a resolution of this larger problem. On a larger scale there is the issue of international regulation. Many businesses are subject to regulation by a number of national governments. The adoption of standards for the rulemaking systems used by federal agencies in the United States will be a step towards the development of interoperable online systems for viewing regulations worldwide. In the long term this will allow the development of “one-stop” services for businesses to view the global regulatory environment.